Free crochet flower pattern is easy to make and very attractive for embellishments to gift wrapping, hand bags, hats and much more. With larger size hook and variegated yarn, ch 4. Rnd 1: 13 sc in 4th ch from hook; join in first sc. Rnd 2: Ch 3, sl st in 3rd ch from hook—picot made; in each rem sc work (sl st, ch 3, sl st in 3rd ch from hook—picot made); join in joining sl st.
With smaller size hook and 1 strand of eyelash yarn and 1 strand of sport yarn held tog and leaving a 6-inch end, ch 4; 5 dc in fourth ch from hook; remove hook, insert hook through top Ips of 3rd ch of beg ch-4 and in fifth dc, yo and draw 1p through both sts. Fasten off, leaving 6-inch end. 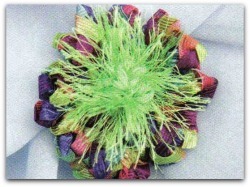 Draw both yarn ends of Center through middle of Flower and sew to back of flower.